Measurements of engagement in mobile behavioural interventions? Mobile digital behaviour changes interventions (mDBCIs) are becoming increasingly useful and necessary within healthcare and wellbeing. Health interventions need to close the gap between intention to behave and the behaviour itself. If apps fail to engage users, the behavioural intervention material is never seen. 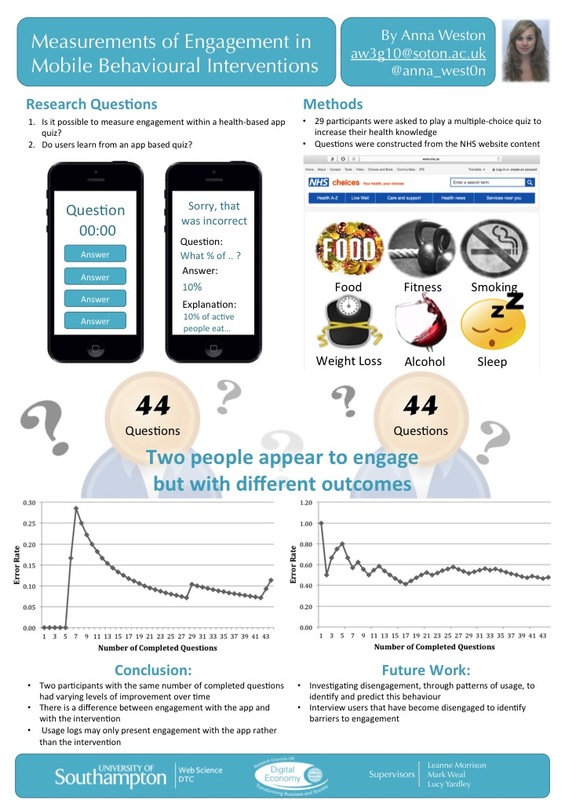 This paper investigates the measurements of engagement using a health based quiz app. Quiz questions were created using the NHS website and fell into the following six categories: “healthy eating”, “losing weight”, “sleep”, “fitness”, “food” and “smoking”. Gamification features such as count down timers were used to encourage user participation. Notifications, with individual goals, were sent out to nudge the users to play the quiz. Engagement was measured in two ways. Firstly, a count of completed quiz questions to illustrate app engagement. Secondly, a participants learning was evaluated using a learning curve. This measured whether a participant understood and retained the health facts, illustrated by an improvement in their answers over time. A comparison between two participants using the first measurement (count of completed quiz questions) would have shown an identical rate of engagement, both answering 44 questions. However, the second measure (engagement with app content) showed a different rate of engagement. One participant improved producing the expected learning curve whilst the other consistently answered questions wrong, showing a lack of engagement with the intervention material. Weston, Anna, Morrison, Leanne, Yardley, Lucy, Van Kleek, Max and Weal, Mark (2015) Measurements of engagement in mobile behavioural interventions? Digital Health 2015, Italy. 18 - 20 May 2015. 8 pp .